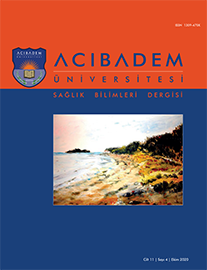 3Koç Üniversitesi, Hemşirelik Fakültesi, İstanbul, Türkiye DOI : 10.31067/0.2018.25 Objective: The purpose of this study was to determine the prevalence of self medication among adolescents. Material and Method: This descriptive study population included 750 adolescents between the ages of 12 and 18 without any identified health problems. Data collection, "Self Medication Use Evaluation of Adolescents" form which was developed by the researchers was used. Results: The average age of the participants was 14.4 ± 1.31 years. Sixty-two-point three percent (62.3%) of the adolescents had used non-prescription medication in the past year and the most commonly used medication was analgesics (61.5%) and the second group was antibiotics (45.3%). Eighteen-point four percent (18.4%) of the adolescents had used antibiotics without prescription 2-3 times in the last one year. Antiallergics, dermatological products and vitamin supplements are other medicines that adolescents used without prescription.